Challenge: The fast-growing Hampton Roads region in Southeastern Virginia is surrounded by water. With a population of two million, the area also has to deal with choke points in its transportation system—especially at two tunnel crossings of the Elizabeth River. Preliminary construction estimates to build a new tunnel and to improve the existing tunnels and nearby highway exceeded available funding. In 2012, VDOT found the answer to improved traffic flow through one of Virginia’s first public-private partnerships (P3) with Elizabeth River Crossings (ERC). ERC would design, construct, finance, operate, and maintain the improved facilities, and in exchange would charge tolls on the tunnels for a set period. As the area does not have space for traditional tollbooths, all tolling would have to be electronic, requiring tunnel users to have an E-ZPass. This project presented several sizeable challenges to overcome. First, the market had limited experience with tolling and the two existing tunnels were not tolled. Consequently, the E-ZPass announcement wasn’t met with open arms. When tolls were first announced, citizens and businesses, especially in Portsmouth, immediately reacted. Opposition formed and news media quickly started covering the escalating story. To make matters worse, the City of Portsmouth sued VDOT to eliminate tolling on the tunnels as tolling would have a relatively greater impact on Portsmouth’s residents and businesses compared to Norfolk. Media coverage ran strongly negative regarding tolling. Action: To complete this task, VDOT hired SIR to develop and execute a public education campaign focusing on three goals: increase awareness of the E-ZPass requirement, show how tolling helps ease congestion, and stimulate transponder sales.To complete this task, VDOT hired SIR to develop and execute a public education campaign focusing on three goals: increase awareness of the E-ZPass requirement, show how tolling helps ease congestion, and stimulate transponder sales. SIR developed the two-phased messaging strategy for the campaign. Phase 1 focused on information and education about the tunnel improvements, related community benefits, and construction, which had already started. Phase 2 hyper-focused on increasing E-ZPass accounts after tolling began. SIR produced the creative for the campaign, including radio and TV ads, online banners, outdoor digital banners, and newspaper ads. The media buyer ran a fully integrated, geo-targeted 90-day campaign that covered television, newspaper, outdoor, radio, online, and mobile markets. Additionally, the project team also conducted an aggressive PR and media relations campaign in the region to help change the tone of the public conversation regarding tolling. 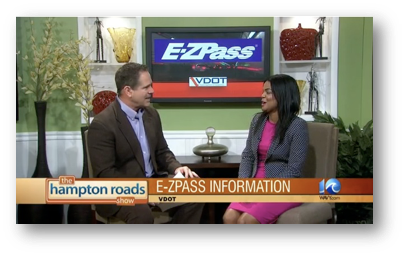 Over the 45-day campaign, a number of local TV and Radio appearances helped VDOT drive home their key message in support of the advertising. Results: VDOT’s Crisis Communications Plan helped redirect the community conversation. In a pre- and post-campaign survey, the number of mentions of tolling fell by 40% and the number of mentions of E-ZPass increased by 83%. VDOT not only achieved its goal of 75,000 new transponders issued in the region, but the agency exceeded the goal. 86,000 new transponders were issued by Feb. 1, 2014. The campaign continued after February, bringing in 144,000 additional transponders by June 1, 2014. Traffic volume in 2014 was approximately 20% lower than in 2013. Awareness of how to obtain an E-ZPass increased due to the campaign. In a pre- and post-campaign survey, the number of residents who were aware of how to obtain an E-ZPass increased by 31% and those who are likely to obtain an E-ZPass increased by 33%. Because of the campaign’s success, the campaign won the 2014 AASHTO TransCom award for Issues and Crisis Management Communications.